Drought in Colorado on June 21, 2018. More than two thirds of Colorado is now in a state of drought, according to the U.S. Drought Monitor. The southwest corner of the state has been designated by exceptional drought, the drought monitor's driest category. 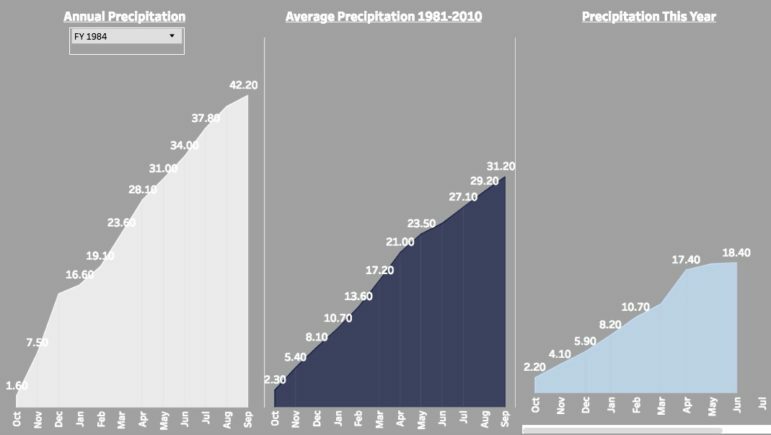 Precipitation in Aspen 1984, in an average year, and in 2018. Annual precipitation in Aspen has fallen dramatically since 1984, and this year's drought has brought the city well below the 30-year average. The city of Aspen declared a Stage 1 water shortage May 18 after flows peaked about three weeks early on Castle and Maroon creeks, which provide most of the city’s drinking water. Stage 1 requires all city property to reduce their water use by 10 percent and urges the rest of the community to voluntarily reduce their water use. But even with improvements in efficiency, water demand hasn’t fallen. 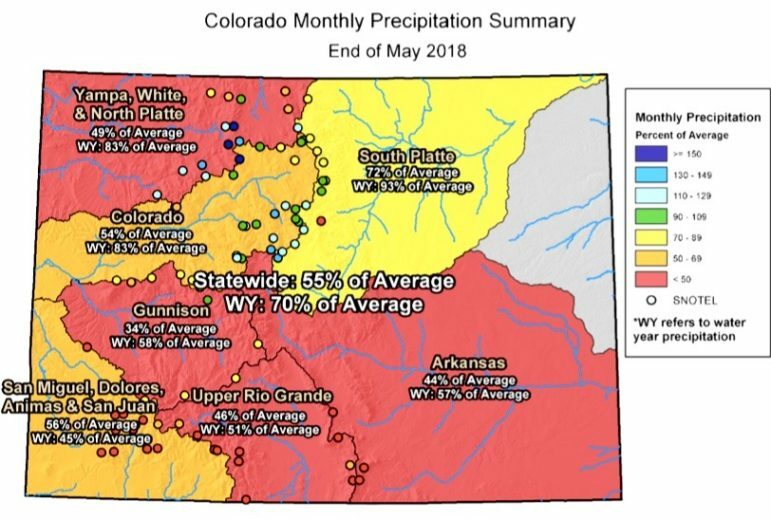 Colorado rainfall in May 2018. The month of May saw record-breaking lows in precipitation in Colorado. The Colorado River Basin received only 54 percent of its average rainfall. Editor’s note: Aspen Journalism is collaborating with The Aspen Times and the Glenwood Springs Post Independent on coverage of water and rivers. The Times and the Post Independent published this story on Saturday, June 23, 2018 (the PI published in its print edition on Monday, June 25, 2018).